oc-cpr will issue a full refund for courses purchased with 24 hours’ notice prior to class. If you are unable to cancel prior to 24 hours’ notice, you will be issued a credit for a future course or materials. Key Codes- Key codes do not expire and are non-refundable. Books: Books cannot be returned after you have attended a course or if they are opened. Students understand and agree that American Heart Association (AHA) requires all students to have the correct book in class with them. You must either purchase a book or bring one with you. Books are available for purchase the same day as class. E- Courses do not require a book in class as you will only be doing skills testing. Any replacement cards are $25. Refunds will not be issued for not passing a course or not completing a course and will not issue a refund to students who do not pass the course for not passing their skills or written exam. If applicable your instructor will work with the student to aid in passing the course through additional training and review. Although in some circumstances we may ask that you return for a remediation course. We will make every effort to assist the student, but there may be times where the instructor will determine that no card can be issued. Course Cancelations by Student: Refunds will only be offered if a student cancels within 24 hours of course. If cancelation is done less than 24 hours prior to class, students will be offered credit for future courses and materials as available. No Show Appointments: No show appointments will be offered a credit for future courses or materials as available. Class Cancelation by oc-cpr.net – should oc-cpr.etc cancel a class, students will be offered a credit for a future course or a full refund. Refunds will be processed within 5 business days of notice. CPR/First Aid courses- oc-cpr and American Heart Association encourages everyone to learn CPR and First Aid. To receive a card – students must successfully complete the class by scoring 84% or higher on any applicable exam and fully demonstrate all skills unprompted and unaided as directed by American Heart Association. Remediation- at times a student may need more training or review to pass the written exam or skills testing, oc-cpr will work with each student in their best capacity to aid the student in successful course completion. There is no guarantee that every student will pass the course. Students who fail the course may retake the course at no additional fee during one of the scheduled course dates. oc-cpr will issue to all students who complete the course successfully a course completion card bearing the AHA logo the day they have taken the course. All Cards issued by oc-cpr.net, require students to have hands on skill testing with an instructor. No student will be issued a card unless they pass their skills unaided and unprompted and pass any written exams applicable with a score of 84% or higher. Replacement cards must be replaced by our Training Center and take up to 10 days for replacement after arrangements have been received. Please contact our office should you lose your card at (866) 622-7726. Equipment: All equipment used in training courses shall be properly decontaminated after each course. Each student will be provided with proper barrier devices and or training equipment to use during the course. Attire: Students will be sitting, standing, kneeling during the courses. We recommend wearing comfortable, appropriate and loose fitting clothing for your course for comfort. Meals/Beverages: Students may bring beverages and food to class. Students will be asked to clean up after themselves and must wash their hands prior to using equipment. 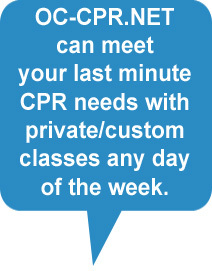 ADA compliant: All students may take a course through oc-cpr.net. Should the student need special accommodations do to physical limitations please contact your instructor prior to class so that we can make proper accommodations for you. As with all AHA course for ANY student to receive a card they must demonstrate their skills unaided and unprompted and pass any written exams applicable with a score of 84% or higher. 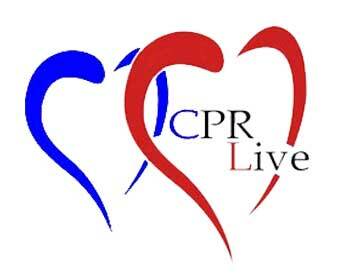 Learn CPR it saves lives! The materials that OC-CPR.NET has provided “as is”. OC-CPR.NET makes no warranties, expressed or implied, and hereby disclaims and negates all other warranties, including without limitation, implied warranties or conditions of merchantability, fitness for a particular purpose, or non-infringement of intellectual property or other violation of rights. Further, OC-CPR.NET does not warrant or make any representations concerning the accuracy, likely results, or reliability of the use of the materials on its Internet website or otherwise relating to such materials or on any sites linked to this site. In no event shall OC-CPR.NET or its suppliers be liable for any damages (including, without limitation, damages for loss of data or profit, or due to business interruption,) arising out of the use or inability to use the materials on OC-CPR.NET Internet site, even if OC-CPR.NET or a OC-CPR.NET authorized representative has been notified orally or in writing of the possibility of such damage. Because some jurisdictions do not allow limitations on implied warranties, or limitations of liability for consequential or incidental damages, these limitations may not apply to you. OC-CPR.NET proudly services the communities of South Orange County, North Orange County, Los Angeles County, Riverside County, San Bernardino County, San Diego County, Aliso Viejo, Anaheim, Brea, Buena Park, Capistrano Beach, Cerritos, Costa Mesa, Coto de Caza, Cypress, Dana Point, El Toro, Emerald Bay, Foothill Ranch, Fountain Valley, Fullerton, Garden Grove, Irvine, La Mirada, La Palma, Ladera Ranch, Laguna Hills, Laguna Niguel, Laguna Woods, La Habra, Lake Forest, La Mirada, Long Beach, Midway City, Mission Viejo, Newport Bay, Newport Coast, Orange, Placentia, Portola Hills, Rancho Santa Margarita, San Clemente, San Joaquin Hills, San Juan Capistrano, Santa Ana, Santa Ana Heights, Stanton, Trabuco Canyon, Tustin, Tustin Foothills, Villa Park, Westminster, Whittier, Yorba Linda. San Fransico, Oakland and the Bay Area.